To all of you who celebrate, I hope you have a wonderful day filled with good memories. To those of you who celebrate something else, please forgive us once again our annual excesses. And for those of you who are struggling right now, I wish you survival, good alcohol (if appropriate), and good company (if desired). My favourite holiday song this year is Tracey Thorn‘s Joy, discovered from an internet friend many moons ago. It puts the darkness and the light together in a way that I think is better and truer than the constant onslaught of Merry Merry Merry. I hope you love it as much as I do. 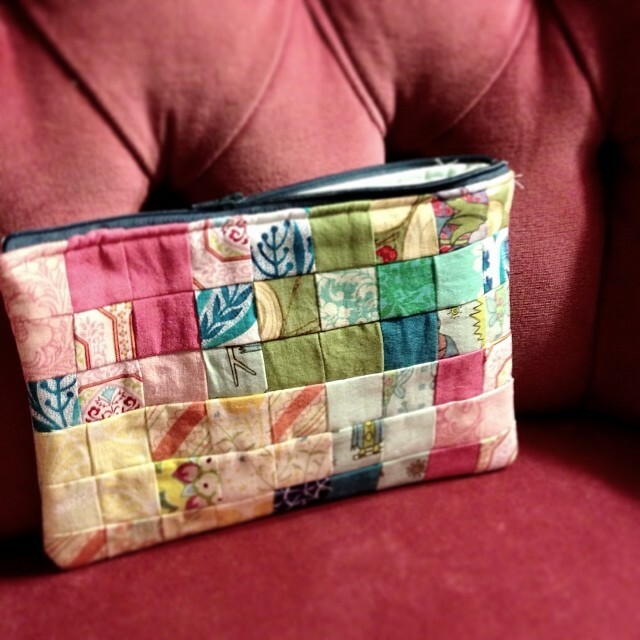 I’ve had Vintage Quilt Revival for about a year, and finally got around to making a project from it. The blocks, projects, aesthetic and photography are all very appealing and pretty. But either it was my dumb luck, or the book suffers from a number of errors, because the cross-patch bag project’s measurements were all wrong. What it is supposed to look like, when done, assuming you pick the same colours and all in solids, which I didn’t. It is supposed to make an 8.5″ block before finishing. The book tells you how many of each type of block to cut out, and in what size; this I did, right off the bat. Then it says to get the template off the included cd and print 16 copies and use foundation piecing to put them together. Well, this is absurd. 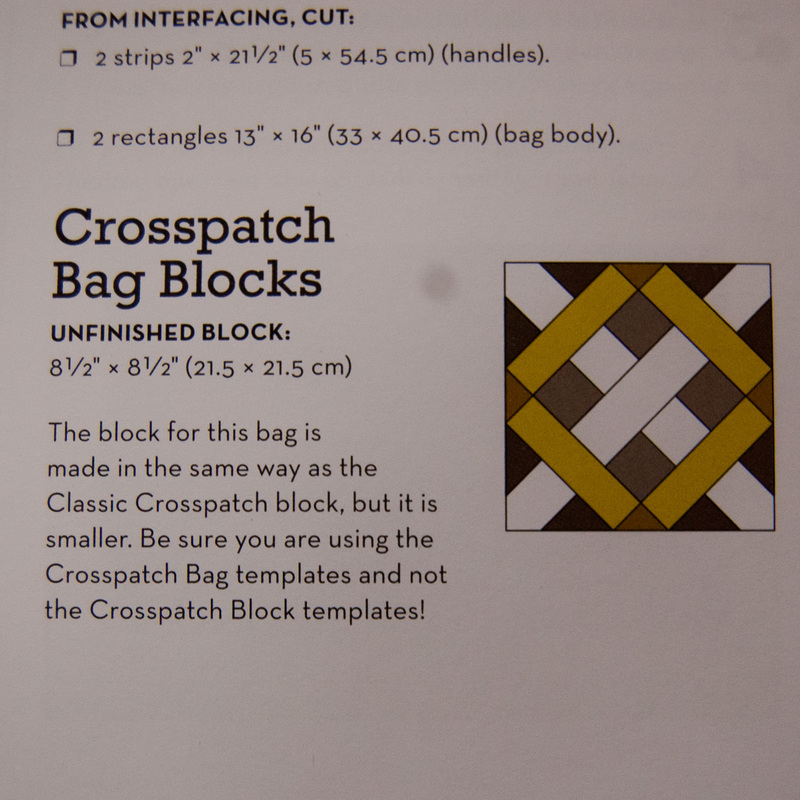 The cross-patch block is not difficult, from a piecing perspective. Careful measurement and piecing will work to produce a good block without wasting 16 pieces of paper. Also, I don’t have a cd drive on my computer, and I’m not buying a new laptop so I can make better use of a $20 book. The block. See where it says 8.5″? And see how simple and straightforward the assembly is? Why would they require a reader to use foundation piecing? Also, when I say “inner” I mean “inside the yellow border,” and when I say “outer” I mean everything else, including the yellow rectangles. Or it would work, if the measurements given for cutting were accurate. Finished block. You can see how it wouldn’t really work if the inner squares and rectangles were thinner than the outer ones. So I made up the first block just following the diagram, and the lattice arms on the outer portions were about an inch wider than the arms in the inner portion, completely breaking the interwoven effect. I had to take them apart and trim an inch off of the outer lattice pieces to make the effect work–and at that point, of course, it was no longer 8.5″. It was 6.5″. Which would mean a bag that was 12″ across instead of 16″ across. Not something I was really keen on. 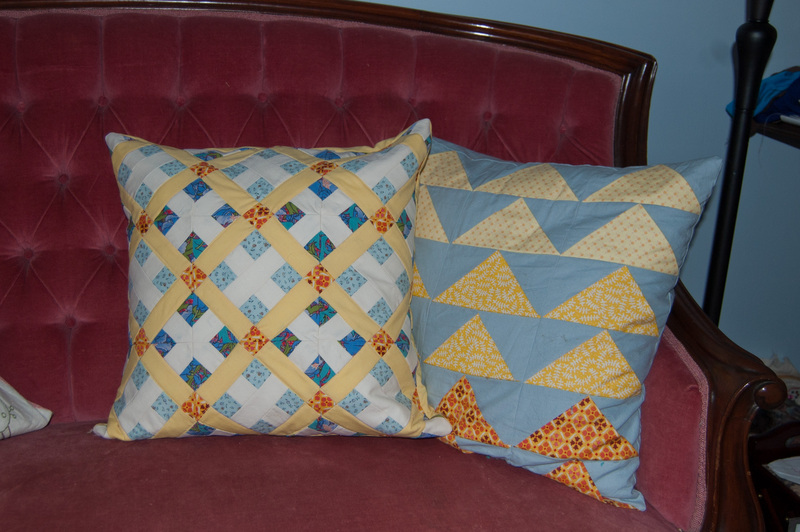 So I trimmed all the outer pieces into sizes that would work with the inner pieces, cut out pieces for one more block, and turned it into a cushion cover. (3 blocks x 3 blocks with an envelope back in a solid yellow.) It’s a very pretty cushion cover, and I’ve had the 18″ form inside it hanging around for years, waiting for an appropriate home. 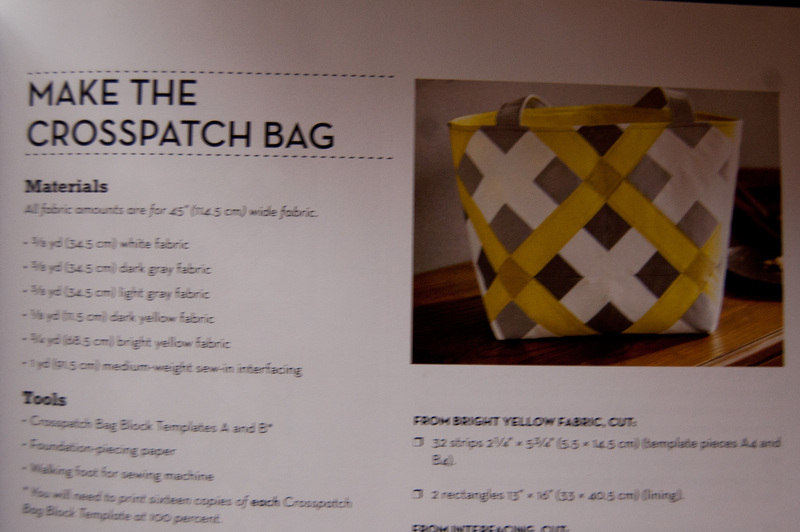 But it’s not a bag, and I’m not sufficiently motivated to try another project from the book to see if they have more accurate cutting measurements. I’ll just use the book for inspiration, and use block instructions from elsewhere. It’s a very pretty cushion. It’s just that I wasn’t really planning on making a cushion. I’m starting to think, though, that I may be one of the few people on the planet who waits to review crafting books until after I’ve tried a project from them. This book has a lot of good reviews on GoodReads, but none of them mention anyone having actually made something from the book. Buyer beware. Mid 2012, I bought a house. And then got a lawnmower, bbq, etc., to go with the house. As one does. End 2012, the old car fell apart on the highway and I had to buy a new one, and my bike was stolen. In 2013, my cell phone, laptop, printer all died. A birch tree in the backyard died and had to be taken down. And I lost my job. I found a new one by the end of the year, but still. And in 2014, my 60-foot retaining wall rotted apart after our very snowy winter and needed to be replaced. It’s like everything in my house is determined to break all at once. With the exception of the bike (I still haven’t replaced it), nothing could wait. The consequences of not replacing whatever it was was always more costly and difficult than going ahead with it. This is not to say that I could, by the time the retaining wall gave out, actually afford it. Single mom–one income–seriously depleted bank account thanks to house and car downpayment–ongoing mortgage and loan rendering it difficult to rebuild savings–all equals some debt for the retaining wall. Curses. If you’ve known me for longer than fifteen minutes, you’ll likely have heard me compare the costs of climate change to a roof on your house. Yes, if the roof leaks, it is expensive and a total PITA to repair it. Maybe you can’t afford to fix it right now. You’re still better of fixing the roof, because if you don’t, you’ll end up losing your house to rot. Go into debt if you need to. Well, guess who found shingles on her lawn this morning. There was a massive windstorm Monday night this week, and it apparently did more damage than I was really, really, really hoping it would do. I was really, really, really hoping that the roof would last through one more winter, and I could replace it in the spring after paying down the retaining wall. I so can’t afford to fix my roof right now. But I guess I’m going to have to. If only I could sew a new roof … but no. What this does mean though is that my current super-strict sewing budget will need to be both stricter and in place for longer. Sigh. I love it when I become the living embodiment of my own analogies. I had some issues with 1, 2, 3 Sew–such as errors with project instructions and cutting measurements–which I was happy to see not repeated in this book. Still in regular rotation as an office tote-bag. The measurements for all the projects I’ve tried work and the instructions are clear and result in a good product. My 10-year-old daughter even tackled the first project (I did the slicing and pinning), and made a lovely checkerboard. My one complaint is that most of the projects are best suited to solids and many are quite basic. While yes, I am learning to quilt, the occasional bit of complexity would be a welcome break. Still, it’s a good and accessible introduction to quilting. Highly recommended if you are considering making quilts but don’t know where to begin. 2013 really knocked the stuffing out of me. It then dragged the stuffing into the street, spread it all over, and drove on top of it in a muddy mac truck with snow chains on the tires. I have gathered up my precious stuffing, but it is now hiding under the bed, still rather filthy and bedraggled. 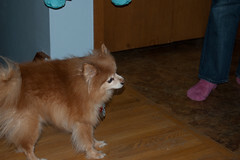 It is in desperate need of laundering and a good fluffing session, but so far it prefers to shiver in the dark. I will not lie to you (and why would I?). Working in the wind industry was definitely one of the big gashes through which much stuffing escaped to the street. At some point, years from now, I may have more perspective on the entire experience. I’m not there yet. Certainly receiving threats of civil unrest and personal violence, and regular accusations that I must be in it for the money, from people who felt it their democratic right to abuse power developer’s consultants, was very interesting. Of course, my daughter’s ongoing health issues, a few new health issues of my own, some criminal activity on the part of an ex that affected me rather directly, and a year in which every expensive thing in my house (except the furnace–please god not the furnace, not yet) broke, all contributed. My poor stuffing. Just listing it all out like this has it shaking in its wet, fleecy boots. Anyway: 2013: good riddance to bad rubbish. Don’t let my machete knock you on your way out the door. Etc. 2014 looks at this point to be potentially a better year. After ten long years (ten! long! years!) we actually have potential diagnoses for my little girl, which come with actual potential treatments that may vastly improve her health and quality of life. For this I will be immensely grateful, once I can articulate the decade-long wait without anger and see something good happening for her, both at the same time. I have a new job. So far I am really enjoying it. Also, so far, no one has told me I should die. Hurray! My own health issues seem to be resolving–possibly they were stress-related. Even my blood sugars are better so far this year. Which is weird. Good, but weird. Anyway, I have high hopes for 2014. Including that my furnace will continue to heat my home for a few months more. What I don’t have right now is the ability to do any kind of environmental activism. Which is sad. A couple of times a day, I’ll consider it briefly–consider writing or reading or sharing links or going to a meeting or something–and even this will cause the stuffing to retreat further under the bed. I know that it will come back, since it is ultimately as inseparable from the rest of me as my eye colour or addiction to printed matter, but in the meantime I will allow my stuffing to act as if we are not living in the middle of the Sixth Great Extinction. A short denial period, purely in the interests of recovery. Hence a lot of silence here (you may have noticed), which brings me now to … well … here. Dear Readers, what should I do with this place? Leave it empty until I can look at a climate report or protest ad without shuddering? Or talk about what I am actually doing these days? Now I know that the vast majority of you are already FB friends and you know full well what I am doing these days: I am sewing. (And working and taking care of the house and the dog and the kid, but when all that’s done, I am sewing.) And crocheting. And I am reading about sewing and crocheting. And I am shopping for sewing and crocheting supplies. And this is pretty much what I am doing. Every year since I was … well, actually I can’t remember how old I was when I started to write New Year’s Resolutions, but it was a pretty comprehensively long period of time ago, and they have always been focused on self-improvement. I will exercise more! I will test my blood sugar more frequently! I will send out x article submissions! I will read y# books about science! I will volunteer at a shelter! I will donate 5% of my after-tax income to charity! I will learn how to cook m# new recipes! And so on. Every year. Most years I’d even do it. Last year, I accomplished essentially none of my resolutions–except the one to ditch the Diet Coke, which has me unreasonably proud of myself. Still, my self remains resolutely unimproved over its late-2012 incarnation. My self wants nothing to do with improvement of any kind, unless it involves improving my bed through the addition of a lovely new handmade quilt. But that’s bed-improvement. Not the same thing. This year I don’t even have any new year’s resolutions, except to Have Fun. All in the interests of stuffing recovery, you understand. Now for other people, Have Fun might mean going out to restaurants or to movies or new clubs or parties or the kinds of things that involve other people laughing and drinking alcohol. I am not opposed to these things and I may participate should the opportunity arise, but the kind of Fun I am determined to Have involves … sewing. And crocheting. I will sew clothes. They will be pretty and I will wear them. I will sew a throw quilt for the living room. It will be a critter quilt. Then I will sew a quilt for my room. This may or may not happen this year, since quilts take a very long time and I have a very long list of crafty goals to accomplish. I will crochet two sweaters. They will be comfortable and pretty and not-beige. I will crochet on weeknights, since it’s something quiet I can do while Frances is sleeping. On weekends, I will sew and make a big noisy mess. I will dye fabrics using cochineal, logwood and onion skins. You’d be surprised at the onion skins. It results in a particularly vibrant and sunny shade of orangey-yellow. I will turn these dyed fabrics into cute little handbags. Some of them I will keep. Some of them I will not. What other things can I turn hand-dyed fabrics into? I’m sure I’ll think of something. I will learn to sew with leather. Or suede. Or both. Why not? Should I crochet a throw blanket? A nice cuddly throw blanket in a lovely soft colour out of some lovely decadent fibre like cashmere or alpaca? Just to have something I can cower beneath while my stuffing recovers? I don’t know. I am torn on this one. I will cook some new things. When I feel like it. No pressure. And I will bake scones which will be eaten with our homemade strawberry preserves. And then I will sew. There you have it, Dear Readers: 2014 in a nutshell for me. I will build myself a fortress out of yarn and fabric and emerge from it when I am bloody well good and ready. And in the meantime I suspect all I will feel like writing about will be sewing and crocheting. Should I put it here, if I do? This is where you can weigh in, if you’d like. Here or FB. Do I irretrievably contaiminate my little-read green blog if I post about sewing and crocheting for a while? Should I just let it rest? Can I pretend after the fact that actually sewing up a pretty shirt out of a lovely italian cotton is somehow eco? I kind of doubt it. For about 15 years, I sewed very happily with a very basic entry-level Kenmore machine. It had straight and zig zag stitches and a three-step buttonhole, and a couple of stretch stitches for knits. It was absolutely all I needed for a long time, and this review should be construed in no way as to say that anyone needs a fancier machine for the vast majority of sewing. If you’ve got a machine that does the above, you’ll be able to sew household goods, costumes, clothes, accessories etc. very well. I’d actually say that if you’re new to sewing, spend as little as you can on a basic machine from a good brand (even used, assuming you can try it out before you bring it home); upgrade when you know what it is you like to sew and what kinds of additional features and functions you would most like. 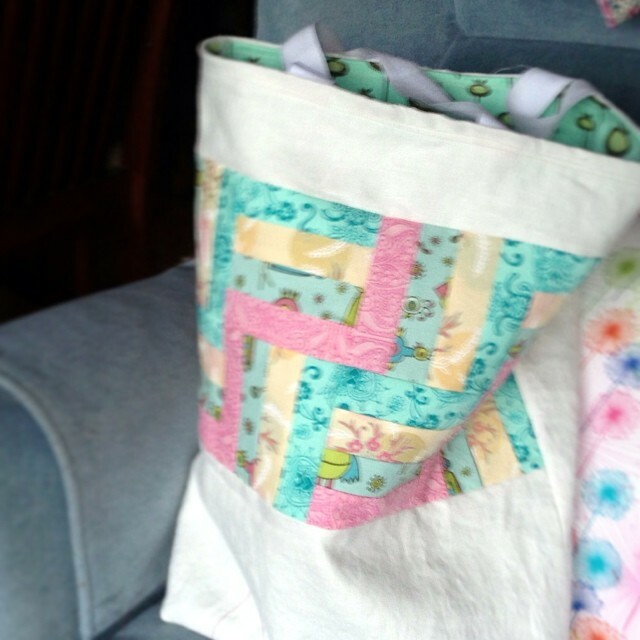 There’s no point in spending a couple of hundred extra dollars on decorative stitches you’ll never use–or automatic buttonholes when you don’t like sewing clothes–or a quilt extension table if you discover you hate quilting. Janomes are reputed to be the world’s most reliable sewing machines; Berninas are good too, if you have the money; Singers are inexpensive, but not as good as they used to be. Basically, Janomes are like Hondas: a really nice little machine at a reasonable price. Two things settled the choice for me: the recommendation of my local fabric store and sewing studio, which is completely stocked with Janomes for their sewing classes; and a recent bit in a sewing magazine, asking the issue contributors what machine they have at home and use most often. One person said Bernina. Every other contributor said they use a Janome. If they’re anything like me, of course, they have more than one sewing machine at home: I have five right now, embarassingly, including my daughter’s, my old broken Kenmore, an antique Singer that I’ve been told works but which I bought for the sewing table it’s embedded in, the new Janome, and a used BabyLock serger that I also adore. I thought it quite significant that for almost all of the contributors, the one they used most often was their Janome. That it’s computerized I didn’t really care about one way or the other. Indeed, the computerized part means it makes a bit of a hum when it’s on whether it’s in use or not, which may be annoying to you. At any rate, computerized models are not superior to mechanical models for most sewing. I’ve now put it through four sewing projects–three patchwork/quilting projects and one piece of clothing–and I love it. It’s a great little machine. Frances has now commandeered this for her personal use to corral part of her mountain of art supplies. 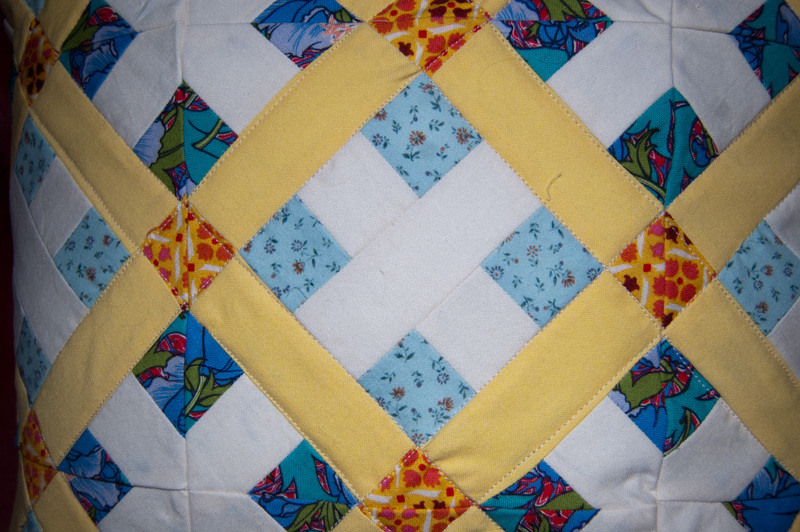 The project came from 1-2-3 Quilt, a book of progressive learn-to-quilt projects. Threading the machine was completely intuitive, assisted by the autmoatic needle threader, and winding and installing the bobbin was really simple. The bobbin is installed horizontally beneath a transparent plastic plate, so you can see how much thread is remaining. You change feet with a button at the back of the foot holder–no screws!–which was fantastic, and the quarter-inch and zipper feet were super handy and very easy to use. The machine sews much more quietly than my old Kenmore. Janomes also can be operated with the use of a start/stop button on the machine itself rather than the foot pedal, and I played with that and found it pretty handy. I’m used to foot pedal operation, so I’m not sure it’s something I’m going to use often, but for someone shorter who has a hard time reaching a foot pedal or who hasn’t spent fifteen years sewing with one, I think it could be really great. It also has a button to control whether the machine stops with the needle raised or lowered. Most of the time I use it with the needle raised, but lowered is great when you’re fidgeting with curves or corners and need to pivot frequently. 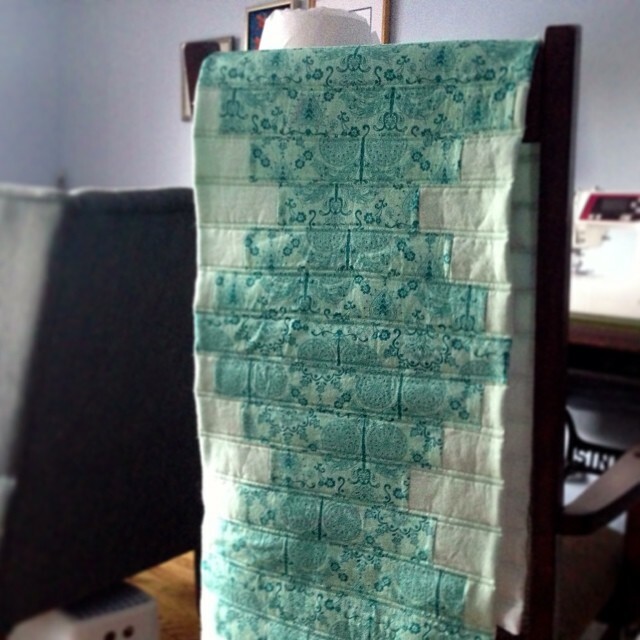 There is only one reason I would sew a table runner. Well, ok, two. I might sew one for a gift, for someone else. But there is only one reason I would sew one for me, and that is as a learning project. It was my second project in the 1-2-3 Quilt book, so I made one out of leftover fabric, and god knows between craft supplies, sewing projects and homework, the dining room table will never be clear enough for it to be used. But it’s done. The quilting extension table came in very handy. It was great to have the project at the level of the machine; kept everything moving through in a nice straight line. I also used a walking foot for the first time ever, and once I got the hang of it, it worked great and made for nice quilting lines with no fabric puckering or pulling. I know the handles don’t match the fabric, but it seemed silly to go out and purchase new cotton webbing for another practice project. Still, it’s cute, eh? And very sturdy. It carries a lot of books. I think I’ll keep this one at my new office for any midday errands I need to run. It didn’t really show me anything new about the Janome, though. aka, Vogue Pattern 1366 , an Anne Klein pattern I got on sale for $3, rated “average” for difficulty. 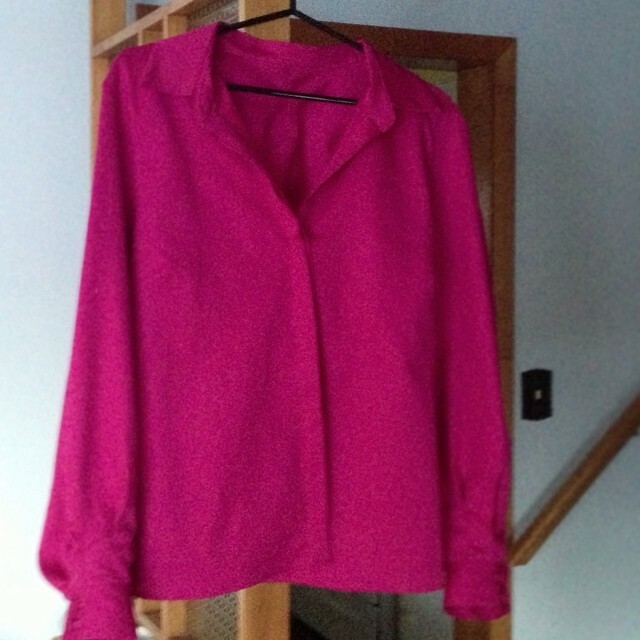 I bought a really nice super-soft bright pink Italian cotton for it on Queen West a month or so back, and I was not looking forward to attempting a buttonhole in this gorgeous fabric with my wonky old Kenmore and it’s fickle buttonhole settings–and this shirt has a lot of buttons. You can’t see them in the picture, but take my word for it. Isn’t it pretty? Look at those cool sleeves! This was where I really fell in love with my beautiful little Janome. Automatic buttonholes! You put the button you want to use in the buttonhole foot, and it automatically sews the buttonhole exactly the right size with the push of a button! Once I got it all figured out (and I do recommend practicing on some scrap fabric pieces first), I put the placket underneath the foot, pushed the button, and got up and went to the kitchen to fetch my tea. And I came back and there was a perfect little buttonhole waiting for me. Just thinking about it I could go downstairs and give it a hug and a kiss right now. 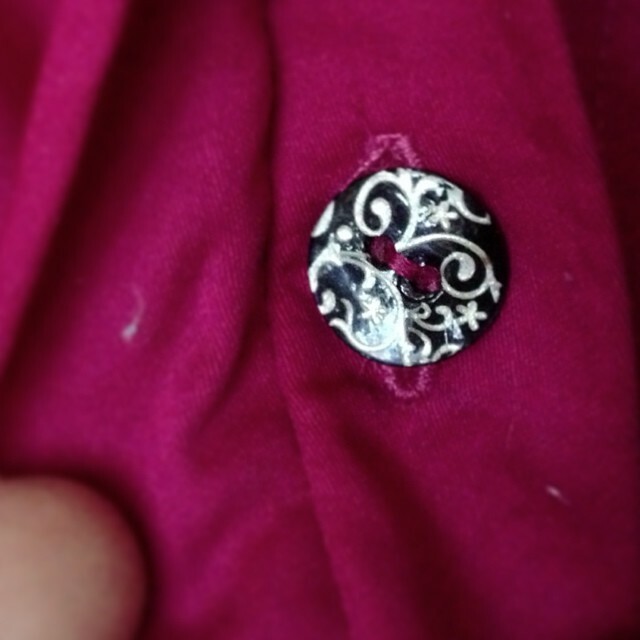 Apparently you can also use the machine to sew on buttons (buttons! ), but I haven’t yet been brave enough to try that. 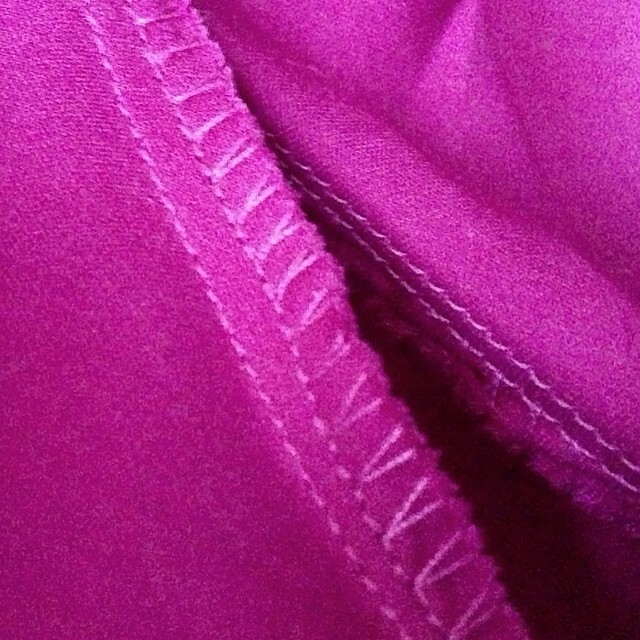 Overlock stitch! You know when a pattern tells you to sew once, sew again 1/4″ away, and then trim close to the second stitch line (if you don’t, it’s for seams with heavy use to reinforce them)–instead I stitched once, trimmed, and then overlock stitched 1/4″ away to get a serged effect without having to get out my serger. The seams inside this shirt are a thing of beauty, I tell you. They will last for 20 years. No tangled bobbin threads; no skipped stitches. All of the accessories are stored in a little flip-down compartment at the front of the machine, so they were all to hand when I needed them. Now, a lot of this is not unique to Janome, and I could have gotten automatic buttonhole features etc. with any number of different brands. But it’s smooth, quiet, makes lovely stitches, is a pleasure to use and designed to be as easy as possible–with things like the viewable bobbin and the button for changing feet, for example. One of the stitch settings automatically reverses at the beginning of a new seam to “lock” it; I haven’t used this yet, but again, I can see how this would be very handy for new sewists. I could have found something much fancier for a lot more money, but I frankly can’t see why. I won’t say the new machine makes me like sewing even more (though I’m tempted to), but I will say that it has eliminated some not insignificant frustrations from my old machine, and I can’t wait to start on my next project (that’ll be the fifth since buying the machine last Friday). Pants or throw quilt? Throw quilt or pants? I suspect I will be lost in a fabric haze during all my spare time for at least a few months to come. 1. I get more done when my daughter’s at my house. Counter-intuitive, I know. I keep reading about these post-divorce women who embrace their me-time and enjoy getting out and tackling projects when the kids are at Dad’s house, but I don’t think I will ever be one of them. Certainly, six years in, I’m not at this point. During the school year she’s mostly at my house, but in the summer we split time 50/50, and she goes away for a whole two-week stretch. Rather than getting the house whipped into shape or seeing all of my friends in a socializing binge or sewing something for myself for a change, I enter a pathetic little coccoon, characterized by spending more time at work and staring out the window at all the beautiful summer weather, shuddering. 2. I like snakes and spiders. At my office, for some reason, there are always one or two fruit flies around my laptop. If I kill one (and I’ve gotten pretty good at it), another one soon replaces it. I don’t know where they come from or why they are always flying around my laptop screen, but there it is. 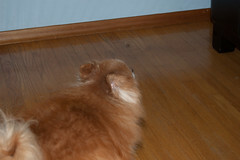 For a short period about two months ago, though, an itty bitty jumping spider took up residence in my office. Not only did I like it just for being a jumping spider (they’re awfully cute, really), and for jumping all over my desk like the world’s tiniest black rubber ball, but I loved it for effectively eliminating my fruit fly problem. When I came back from vacation, no more jumping spider. Fruit flies are back. Curses. 3. I like to make things by hand. What I am making is not important, really, so long as when I’m done there is a physical object that I created. Sewing? Fabulous. Cooking and baking? Absolutely, as my 20-30 cookbooks in the kitchen and freezer full of leftovers can atest. Furniture? You bet, so long as it doesn’t involve a table saw–simply because I don’t own one. Gardening? Of course! This actually is going to be the subject of a post in the near future, once I am released from the grip of Frances-withdrawal. 4. I cannot play any sports involving balls to save my life. Doesn’t matter what kind of ball it is. Once it makes contact with me, it is guaranteed to go the wrong way. 5. I love reading. I started when I was three and have never really stopped. People who say they “love reading but stopped because life got in the way/I have to do so much reading for school/work/whatever” never really loved reading to begin with. Believe me, if you love reading, life NEVER completely gets in the way. 6. I run, in a religiously non-competitive way. I go out, I run for 20-45 minutes, I come home. Really, isn’t being able to run for 45 minutes good enough? Does it matter from a health perspective if I’m covering 5 or 7 or 10 km in that time? I don’t think so. 7. I read poetry. Not only that, I memorize poetry, though often not on purpose. Poetry is where everything interesting and beautiful in language begins. A good poet can achieve in 20 words what will take a prose-writer an essay or a novel to explain. There you go. And now for some blogs. I’m going to go for the “painfully honest” route and list the ones I actually read nowadays, whether they’ve heard of me or not, and regardless of whether it has anything to do with my blog’s theme. In many cases it doesn’t. SouleMama–Amanda Soule is doing all of the things you’re positive you don’t have time to do, and she’s doing it well. Also, she writes some pretty adorable books. This (sorta) Old Life–Home renovations and the Meaning of Life, more or less. feeling stitchy–group blog about embroidery. Absolutely inspiring. Clean Break–a techy/eco blog, often about energy issues in a Southern Ontario context. By Tyler Hamilton, former energy columnist for the Toronto Star and currently editor-in-chief of Corporate Knights (where I published a few articles, once up on a time). If you want to learn about the warm and fuzzy side of Corporate Canada, Corporate Knights is what you want to read. Tyler is going to be absolutely uninterested in a peer award, I’ll bet, but I’ll include him here to point you all towards him and his writing. And Active Kids Club, of course. Kari has started up a movement to connect kids with the outdoors and get them active year-round outside. 1. As the recipient of the award you have to share 7 things about yourself with the blogosphere. 2. Link back to the post of the person who nominated you (me). 3. Copy and Paste the Award logos into your new post. 5. You should let all the lovely bloggers know that they have been nominated so they can claim their virtual reward. Strike/Slip by Don McKay, of Newfoundland, combines living creatures, geology and industry into lovely poems that somehow make the ugly beautiful and bring the natural world–whether pristine or deeply damaged–to life. I loved it, and can tell already that this is a book and a poet I will come back to many times. It won the 2007 Griffin Prize in Canada, and deservedly so, though truth be told I haven’t yet read a Griffin winner I haven’t loved. As a lover of ponds and all the life that supports itself in the murk and the ooze, I can’t tell you how much I loved those lines. It’s true, ponds are humbling. Beautiful, but resolutely not majestic. Lovers (and likers) of nature poetry will find much to love and reread in this collection.